Qingdao Doowin Rubber and Plastic Products Co., Ltd. Underwater lift bags and water filled water weight bags are made to comply with IMCA D016 & LEEA 051. Type Certificated by Drop Test. Heavy-duty material SGS certificated same with water weights. Experienced crane load testing and marine salvage team. Qingdao Doowin Rubber and Plastic Co., Ltd. is a leading manufacturer of underwater air lifting bags, proof load testing water weight bags, lifeboat & davit test water bags, salvage tubes & pontoons, pipeline buoyancy bags, pipe plugs, marker buoys & inflatable PVC fenders, liquid storage pillow tanks, and other products made of heavy duty PVC or TPU coating fabric. We also provide crane load testing service, and rental air lift bags and water filled weight bags. 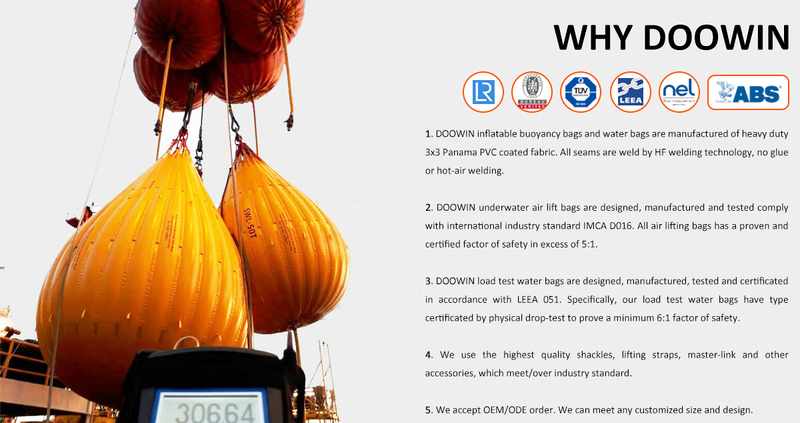 DOOWIN underwater air lift bags include parachute type lifting bags and totally enclosed type lifting bags. The parachute type lifting bags has open bottom type air lift bags and enclosed type air lift bags. The sealed type lifting bags include cylindrical shape enclosed air lift bags, pillow type air lift bags, elongated air lift bags, individual buoyancy bags, vertical buoyancy bags, and twin inflatable buoyancy units. These air lifting bags can be used for the pipeline laying work too. The buoyancy capacity of our air lifting bags is from 50kg to 50ton. 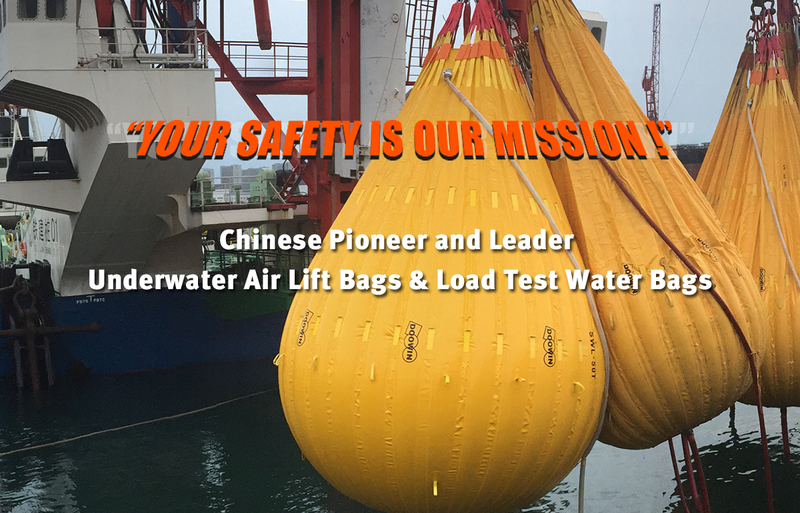 DOOWIN load test water bags include crane test water weight bags, low headroom water weight bags, platform test water weight bags, lifeboat test water weight bags, gangway test water bags. The crane load test water weight bags capacity is from 1ton to 100ton. The lifeboat test weight bags have 100kg, 375kg, 400kg, 600kg. All load test weight bags are supplied with its accessories, ready for use. The wireless load cell will be supplied upon request. DOOWIN collapsible storage pillow tanks include potable drinking water pillow tanks, bulk storage pillow tanks, rainwater pillow tanks, fuel bladder tanks, liquid transport bladder tanks, firefighting water tanks and other special design flexible tank bladders for bulk water, food, chemical and chemical. Flexitank is one kind soft, high-strength, light-weight single-use large bladders with valves. Flexitank is designed to fit inside general purpose freight standard 20 foot ISO container. Flexitanks are used for the bulk transport of non-hazardous liquids that are not classified or regulated as dangerous goods. DOOWIN also make the lower pressure inflatable PVC fenders used for the small boats and yachts. Marker buoys used for the sailing racing. DOOWIN inflatable pipe plugs are flow stoppers for temporary close off or seal an opening. Our inflatable pipe plug and stoppers are very suitable for use in pipeline, ducts, and tunnels with construction, inspection, repairs, cleaning, and repair. With a wide range, good quality, reasonable prices and stylish designs, our products are extensively used for underwater salvage, and the proof load testing of cranes, davits, lifeboats, hoist, ramps & lifts, passenger gangways, platforms and bridges. With a good reputation of quality, DOOWIN is considered as the first choice of many key industry suppliers, contractors and end-users. DOOWIN commits to high-quality products with well-equipped testing equipment and strong technical force. DOOWIN's products passed rigorous ISO9001:2008 Quality Management System. All underwater air lift bags are manufactured in line with IMCA D016 Rev3 Standard. All of our products are BV, SGS, and CCS certified. DOOWIN products are designed, manufactured and tested fully compliant with the international industry standard, IMCA D016 & LEEA 051. We can provide third party LR, BV, ABS, DVN, CCS certificate. Water bags are designed, manufactured and certificated in 100% compliance with LEEA 051 guidenlines by TUV NEL UK. All water bags have a proven and certificated factor of safety in excess of 6:1. Our material are certificated by SGS, which are made by 3/3 fibre panama pattern weave. We use the advanced High Frequency welding technology. The seam has better tensile strength than the material.